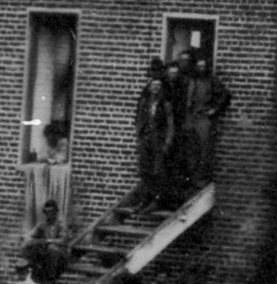 Most of you are familiar with the famous 1864 images of wounded taken in the back yards of Fredericksburg on Charles Street (you can read about the images here). 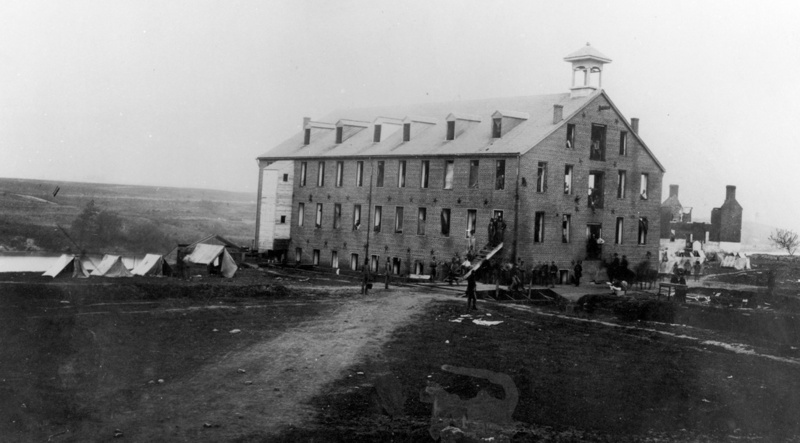 But there is probably no image that better conveys the scale and detail of one of Fredericksburg’s 1864 hospitals than this one, of the Washington Woolen Mill. It is, perhaps, the most interesting overlooked Fredericksburg photograph of the war. 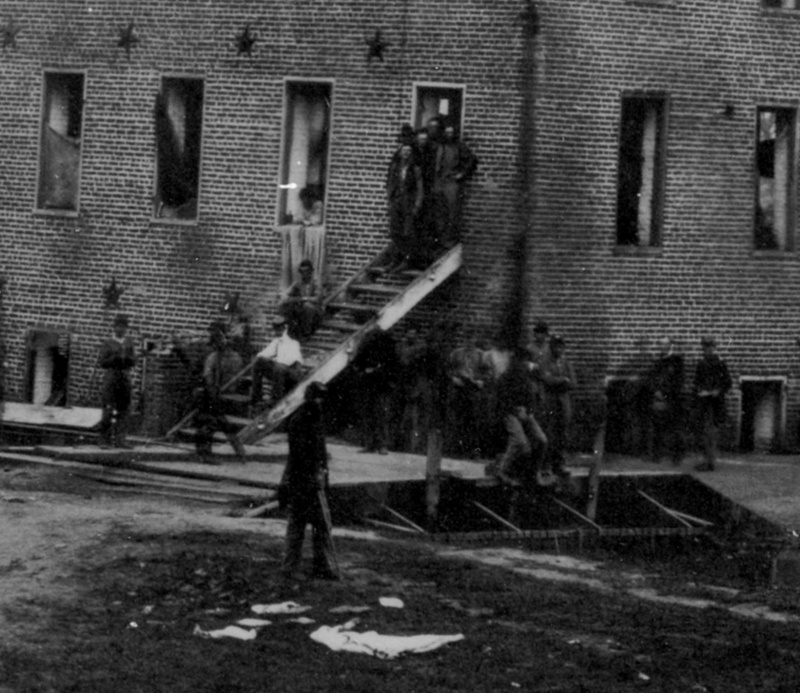 Taken in May 1864, at the height of Fredericksburg’s use as the main evacuation hospital for the Army of the Potomac, the image gives us by far the best visual evidence of the scene so often described by witnesses: wounded soldiers, civilian aid workers, and medical personnel taking over virtually every available building, spilling onto sidewalks and empty lots, transforming Fredericksburg into a “City of Hospitals.” More than 26,000 wounded soldiers passed through Fredericksburg between May 9 and May 27 (there were likely never more than 7,000 in town at any given time). The effort to care for them was a logistical and human achievement that has not been particularly well documented by historians (we are working on that). A wounded soldier on the steps, apparently with a head wound. 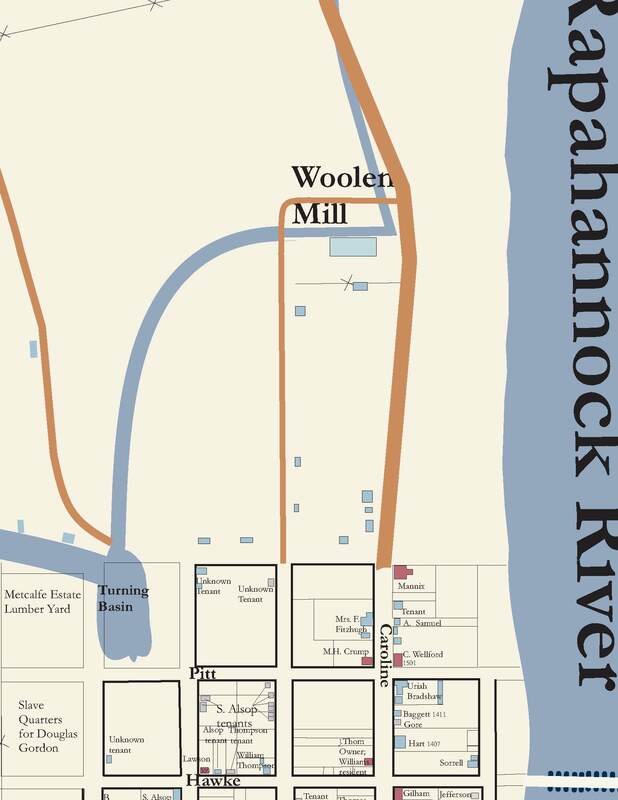 The Washington Woolen Mill stood about a quarter-mile above town, between what is today Princess Anne and Caroline Streets, across from the lower reaches of Old Mill Park. On the eve of the Civil War, the mill was brand new, a corporate undertaking (fairly rare for Fredericksburg, where most businesses were proprietorships) that had shown great promise before its looms were stilled by war in 1862. It was without question Fredericksburg’s largest employer of female workers, with 35. During the first Union occupation in the summer of 1862, the Union army turned it into a hospital; in fact, Clara Barton witnessed her first amputation there in August. In 1864, during Wilderness and Spotsylvania, the mill was designated the hospital for men of the Fifth Corps. On May 19 or 20, photographer Timothy O’Sullivan took this image–full of detail and humanity. The image embodies many small vignettes that speak to Fredericksburg’s ordeal during the war. 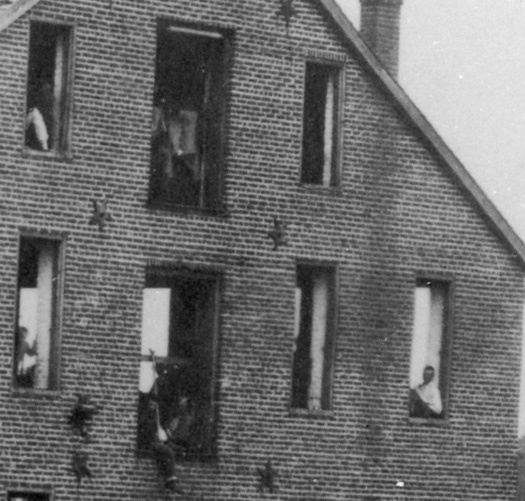 Wounded soldiers hang or peer out of the window openings, from which all the glass has been removed or destroyed, replaced in a few instances by blankets. A burned out building stands next to the mill, a residence or office likely associated with the mill, perhaps destroyed during the 1862 bombardment (though the mill itself doesn’t show much damage from bombardment). Soldiers stand before furniture cast into the road in front of the mill. 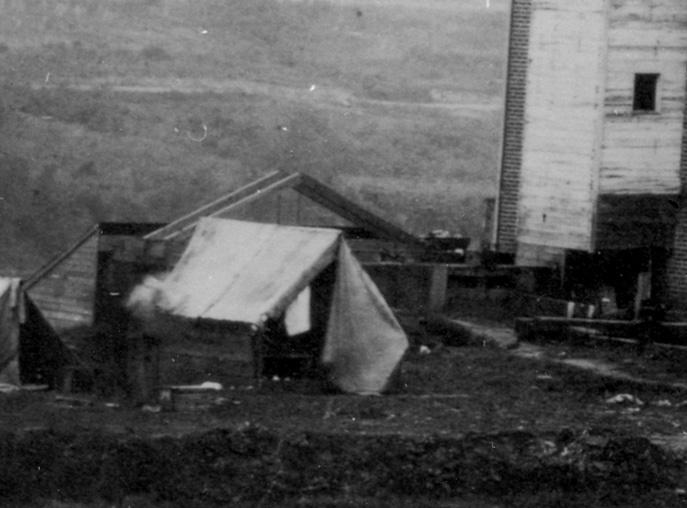 Rows of shelter tents stand in the yard on either side of the mill. In the foreground the canal that brought water to the mill is visible, crossed by a bridge. In the background is Stafford Heights, entirely devoid of trees (this view looks directly into the heart of what is today Pratt Park). At the left end of the building you can see the structure that housed the wheel pit. What of the site today? 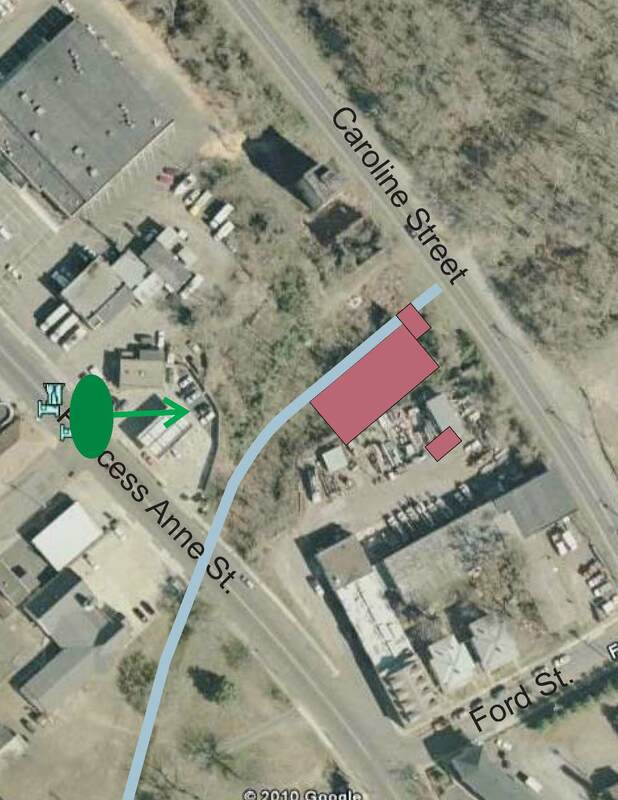 The mill site is located between Caroline and Princess Anne Streets, just north of Ford Street–in an area that is today dominated by light industry. 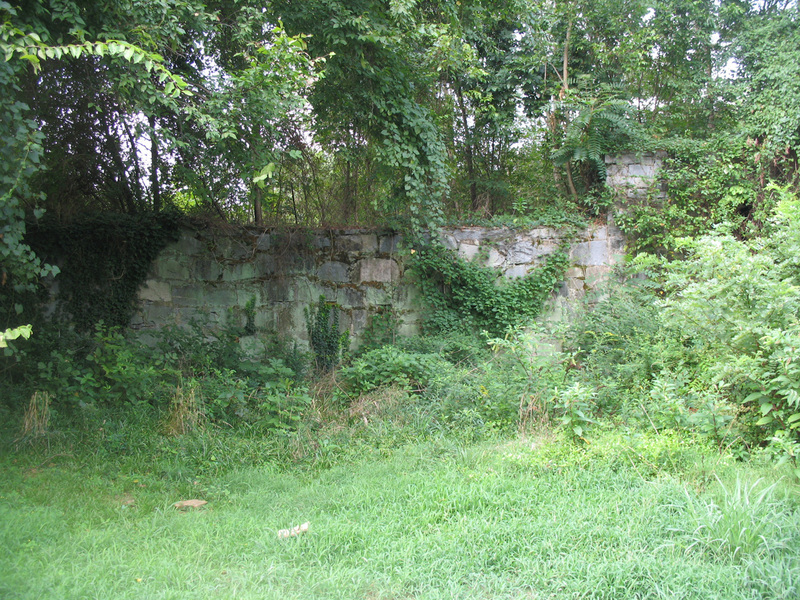 The approximate perspective of the photograph is indicated by the arrow.The site of the mill itself is choked by brush and trees; buildings block the view from the historic perspective. A view along the abandoned power canal that turned the mill’s wheel. The only visible remnant of the mill is the cut-stone wall of the wheel pit, along Caroline Street. This building is 120 feet long by 60 in width, and five stories high, including the basement. The machinery consists of nineteen 6-4 looms and eighteen 3-4 looms, giving employment to 35 female hands. There are also four spinning machines, running 1000 spindles—four setts of cards, one wool pick and one duster—three eye kettles, three fulling mills and a lace to wash wool—three presses for pressing and finishing cloth, and ten 3-4 and twelve 6-4 bars for drying cloth. In this department, in which males alone are engaged, constant employment is given to about 35 hands. This establishment consumes about 800 lbs. of wool per day, and used $10,000 worth of warp since they have been running, all of which is manufactured in the neighboring village of Falmouth by the Messrs. Green. The products per day are about 500 yards of 6-4 kersey of the two colors yellow and slate, wich they sell at wholesale at 70 cents, and about 700 yards of the same color (coarse), at 37 ½ cnts, and also about 150 yards of 3-4 and 6-4 goods, which they sell at wholesale at 56 cents and 112 cents respectively. They have, since they started, shopped 361 bales of goods and have paid as much as $500 in freights in one trip—and their pay roll shows an outlay of $1000 per month in wages. The company are entitled to a power of 75 horses, but are only now using about 45. The canal you mention, is that the same canal that the AoP had to cross in the attack on Marye’s Heights in 1862? 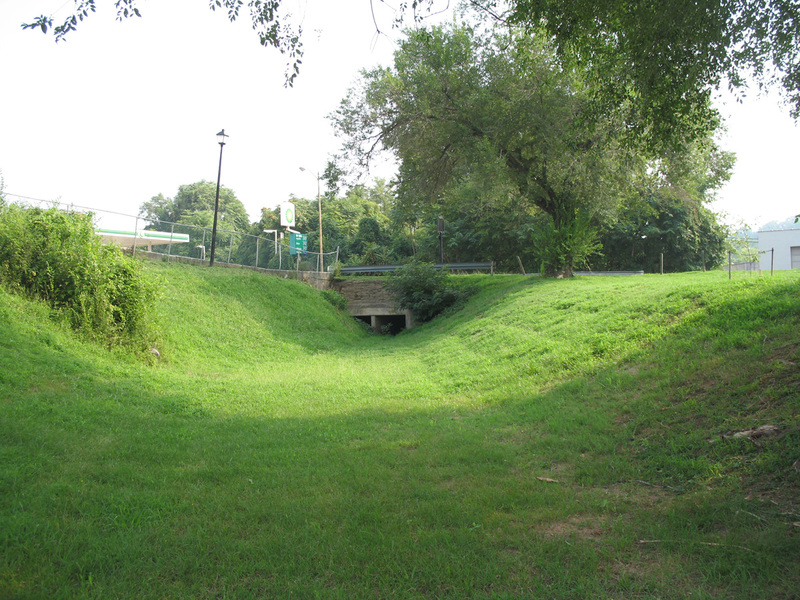 Robert: Both the power canal that fed the Woolen Mill and the “canal ditch” that ran along what is today Kenmore Avenue were offshoots of what was originally built as a navigational system of canals and pools on the Rappahannock all the way to Waterloo. So, the answer your question is no, but they are related. Take a look at the historic base map…the link along the right side of the main page. All the canals and races are shown on there. Thanks for reading. John H.
You mention sites as being identified with the wounded of specific Union Corps. Do you have the location(s) for the wounded of the VI Corps in May 1864 (Spotsylvania)? Jay: We have thorough documentation of the Ninth Corps and Second Corps hospitals in town, but less information on the Fifth (some of it at the Woolen Mill) and Sixth. I’ll do a little digging though and see what I can come up with. It will likely be Monday before I can get at what I need to get at, but I will… John H.